The Next-Generation Transit Survey (NGTS) stands at ESO’s Paranal Observatory in northern Chile. A new alien-planet–hunting telescope has just come online in Chile, and it could help scientists peer into the atmospheres of relatively small planets circling nearby stars. The Next-Generation Transit Survey (NGTS for short) — located at the European Southern Observatory's (ESO) Paranal Observatory — is designed to seek out planets two to eight times the diameter of Earth as they pass in front of their stars. Such a planet will cause the light of the star to dip ever so slightly when passing in front of it, allowing the telescope to detect the planet during its transit. The instrument is designed to measure the brightness of stars more accurately than any other ground-based wide-field survey, ESO officials said. The NGTS is made up of 12 telescopes that will operate robotically, according to ESO. Astronomers using the survey hope to find small, bright planets in order to learn more about the densities of them. By taking these measurements, scientists might be able to learn more about what makes up the planets — that is, whether the planets could be rocky, gaseous, watery or composed of other materials, ESO officials added. This night time long-exposure view shows the Next-Generation Transit Survey (NGTS) telescopes during testing. Many of the 20-centimeter telescopes that make up the Next-Generation Transit Survey (NGTS) are seen here during testing. "It may also be possible to probe the atmospheres of the exoplanets whilst they are in transit," ESO officials said in the same statement. "During the transit, some of the star's light passes through the planet's atmosphere, if it has one, and leaves a tiny, but detectable, signature. So far, only a few such very delicate observations have been made, but NGTS should provide many more potential targets." NGTS' work is only the beginning. Scientists will use other telescopes to conduct follow-up studies of planet candidates that the survey finds when looking at the sky. A consortium from the United Kingdom, Sweden and Germany built the NGTS. ESO is an astronomy organization supported by 15 different countries. The organization operates three observing sites, including Paranal, around Chile. This night view shows the Next-Generation Transit Survey (NGTS) telescopes during testing. The central parts of the Milky Way appear in the background. 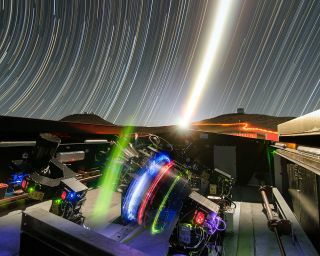 "We needed a site where there were many clear nights and the air was clear and dry so that we could make very accurate measurements as often as possible — Paranal was the best choice by far," Don Pollacco of the University of Warwick and an NGTS project lead, said in a statement.